This app provides the best way to tackle phone addiction and get rid of phone distraction. Its main job is being responsible for encouraging you to be focused. It is a massive remedy for those love to postpone what could be done today, to tomorrow. It reduces that procrastination of yours and ensures you are more responsible for doing things when you should do them. You also get to monitor your focused times in an easy and cool way. As your focus improve, you earn rewards on this app and unlock new tree species. Self-motivation is also encouraged to achieve your set goals. It is available for both Android mobile and tablet devices and can be accessed across all Android devices. This app takes up the responsibility of setting habits daily that can be useful for you as regards achieving goals you have set for yourself. Every day, you hold yourself responsible to all your goals by ticking off the habits on your list. Every daily habit you pass will be shown in green while the ones you are still running from will be displayed in red, to warn you to face it and succeed once and for all. 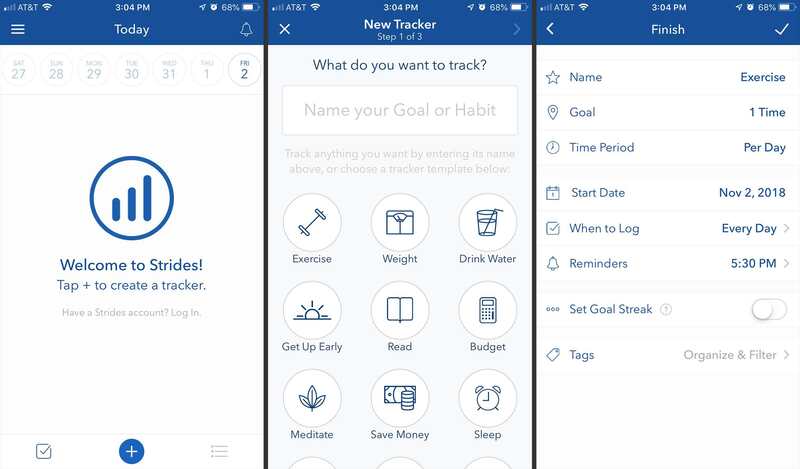 This app is great for planning your goals, monitoring steps taken and enhancing accountability. With the app’s useful tracking and monitoring software, users are aided in finding their strengths and know their weaknesses so all of their personal and professional goals can be achieved. The vision board is for constructing the picture of your goal, so you see and highlight ways of making them a reality. There is also a calendar every week to view precisely what percentage of your goals were met or missed. This can be flaunted on social media if the results were positive and you want your pals to know. If you are the type of person who needs to be continuously reminded of the goals set, this app’s powerful reminders have to be your best friend. This app gives you that little push you require as it is impressive for telling you about your daily goals when you need to hear it. It is quite flexible, easy to use and great at assisting in creating habits. The features are excellent too. It comes with note-taking capability; archive completed goals, an update that takes less than 60 seconds daily. This app is not your regular goal planning app. It is a science-based app that will motivate you to enhance your fitness & make your weight loss goals a reality. It is also great for anyone who has a goal to reduce his or her anxiety. It has integrated exercise sessions where you’ll be coached. There is smart-targeted health advice from time to time as well. It also acts as your one-on-one life coach for all kinds of motivations you crave for. 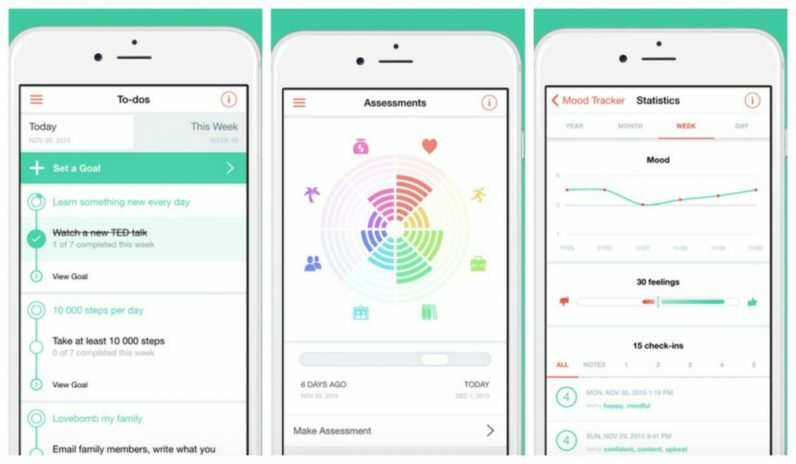 This app is the perfect self-help app you can have on your mobile device for your well-being. If you are fed up of New Year resolutions that only end in disappointment, then this app is for you. It aids you to set, monitor, and achieve your personal goals in all spheres of life. Whether the goals are about beginning a medication, a decision to read, or to quit cigarettes, GOALMAP provides a science-based approach to helping you achieve these goals. This app helps you to remain motivated by offering expert tips and messages to cheer you up. This app helps in achieving your goals faster. It creates a to-do list for your set goals, schedules your day as early as possible, increases your productivity for the day, enhances your efficiency, changes your bad habits and aids in creating good ones. It has a quality goal tracking system to ensure goal achievement is experienced massively. It also does not forget to sends you notifications about when to act and work on your goal. The app is a fresh one, which is more reason why you will be more of a priority. This particular app is useful for goals that have to do with your finance, such as child education or child Marriage, buying a car, setting up a business or a trip. It helps in the calculation of the monthly investment needed for you achieve your goal. You can let this app know the goal present value, No of Years remain Inflation (%) and rate of returns (%) on your investments, and make it do its thing to arrive at the right advice that will only aid your goal. It helps with the direction towards your life goals. With it, you can improve yourself. It ensures your set goals are clear and ensure you engaging in relevant activities to achieve them. The idea here is for you to see the bigger picture of your dreams and goals continuously. This will serve as the motivaion you require to forge ahead towards your goal. 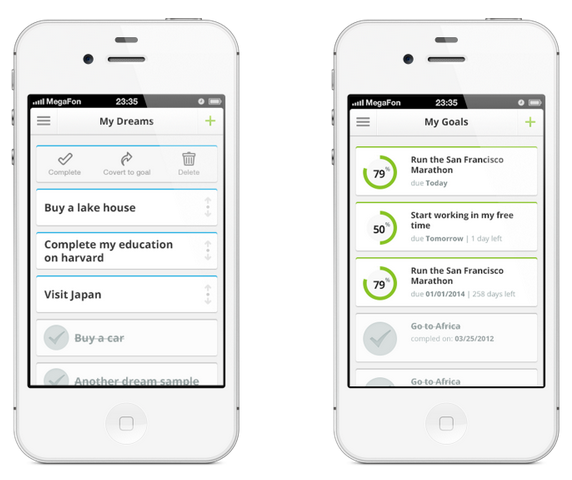 This is a goal-tracking app that lets you set & monitor your life goals. This app is great for controlling your emotions and staying motivated. Everyone has a right to be happy, healthy, and without fear which is also what PurposeColor: Goal Setting & Motivation App is trying to achieve. You get to set your clear personal goals plus it highlights what exactly spurs you on and what holds you back. This is a remarkable success coaching app that will aid your discovering, planning and achieving your most vital personal and professional goals. There are a step-by-step goal setting process and a unique set of practical tools that will boost your productivity and help you achieve your dreams and goals. It helps you to boost your roadmap to success, ensure you have a sense of fulfillment, and lead you till you realize your goals. This is a goal management system that works on you to accomplish your dreams. Setting achievable goals grants you that vision for the coming years. As you achieve it, you get even more determined. Life goals, career goals, are some of the goals that are being discussed here. This app helps to organize and manage your goals, have deadlines designated to the goals and schedule time to work on your goals. This is an app that takes it upon itself to ensure you achieve success by monitoring your goals in life. It can be used for goal-setting purposes for the upcoming week, month or even a more extended period, in areas like personal growth, health, social life e.t.c. The app helps in calculating the progress, visualizing the data, reminding you to continue on the path towards achieving your goal. GoalTracker sets motivational photo for each target. 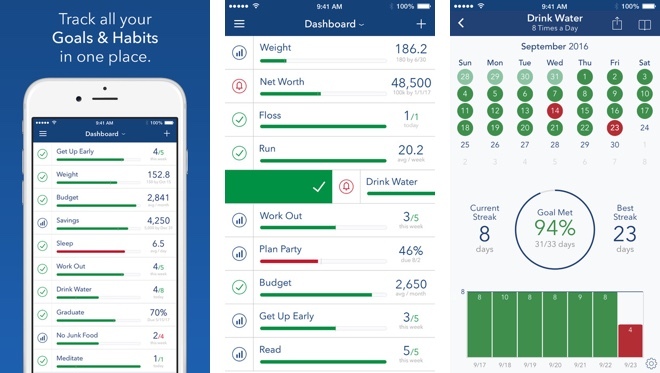 This is an app that will benefit your new year resolution. This app is a system of personal development tool that helps to improve your focus and productivity. The app has A day planner, A life assessment tool, A mood journal and A gallery of expertly crafted goal plans. The purchase is taken care of by your Google-account. This app’s job is to ensure you reach your goals, do away with repeating activities, work on your habits and boost your overall consistency and productivity. Using the free version of this app, you can get it used on up to 3 goals at a time. The application is responsible for allowing you to monitor your progress, set up groups to serve another means of support for one another. 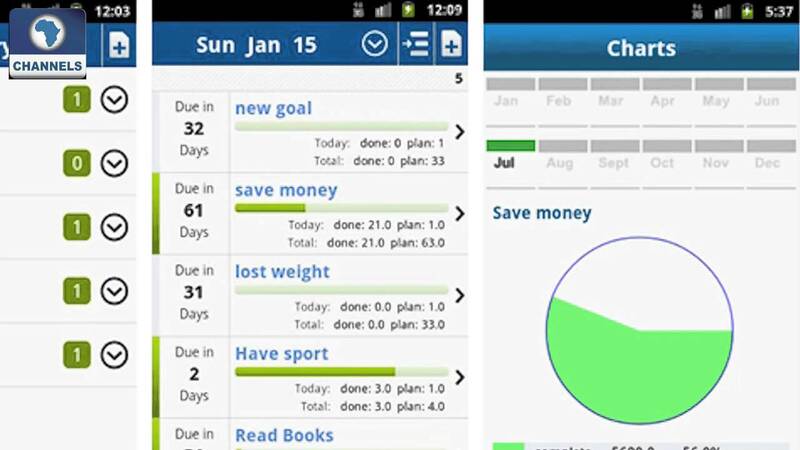 These are the best Goal planning apps for Android and iPhones. Though they all bear different names and different specialties, they all share a standard function. If you have other suggestions for best Goal planning apps for Android and iPhones, feel free to drop them in the comment section below.